Orsu Metals Corporation (TSX-V: OSU) (“Orsu” or the “Company”) is pleased to announce significant drilling results in three additional sections at Zone 23, as part of the 10,000 meters (‘m’) drilling program at its Sergeevskoe Gold Project in Russia. The program is designed to test new targets and to culminate in an estimation of a maiden resource by Q4 2018. 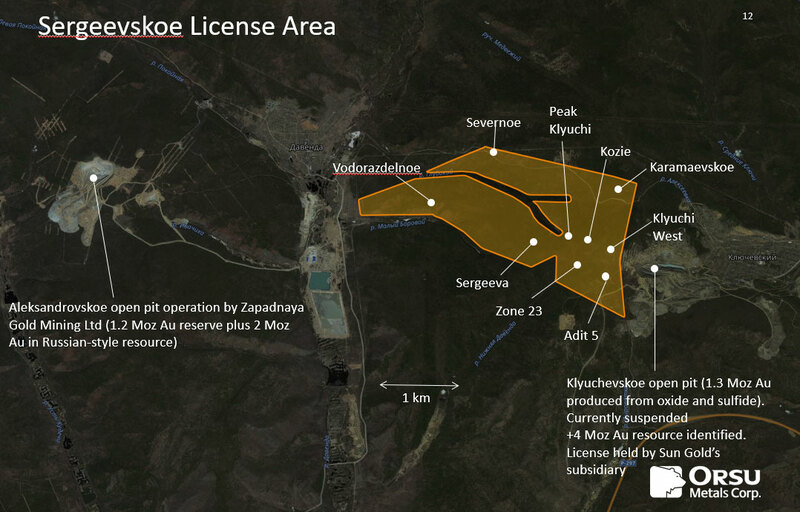 Dr. Alexander Yakubchuk, Director of Exploration of Orsu commented: “Orsu successfully extended the gold mineralization eastward in three drill sections spaced 80 m in addition to the previously reported section 9300E. The Main and Southern stockworks can be consistently traced across four sections from the west to the east for a total of 240 m along the strike. Mineralization was drill-confirmed to a depth of 200-250 m. Its eastern extents limited by mineralized zones of Adit 5, and such relationships are being tested as part of the program. At Zone 23, the mineralized zones remain open downdip and to the west, where mineralization becomes wider and can be seen in historical trenches for additional 300 m westward. Orsu is currently drilling the follow-up holes at the western continuation of Zone 23. If successful, this would extend the strike of Zone 23 to over 600 meters. Sergey Kurzin, the Executive Chairman of the Company, noted: “This announcement summarizes a great deal of progress happening quickly. Zone 23 is only one of the three drill zones that we are working on this year. I count that we meet a similarly exciting mineralization in the other two zones: Adit 5 and Kluchi West, bringing us to an anticipated combined maiden resource of 1.8-2.5 Moz of gold in our first maiden 43-101 resource statement. The results so far exceeded expectations in terms of both thickness and grades”. 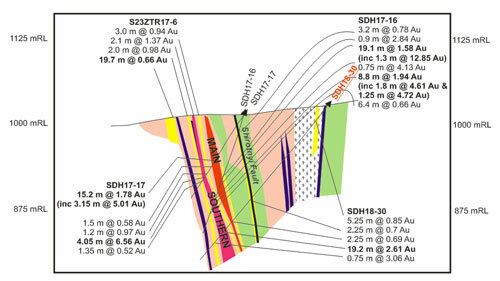 Orsu identified gold mineralization at Zone 23 in four sections to the south of the Shirotnyi fault (Figure 2). The quartz-tourmaline-sulfide stockworks are locally present in the granodiorite porphyry and magmatic breccia stocks to the north of the fault, obliquely cutting the mineralization. They are best mineralized in the west-east-trending stockworks hosted by the granite intrusions to the south of the fault. The Main stockwork was traced eastward from the previously reported section 9300E to the sections 9380E and 9460E. The Southern stockwork extends from section 9300E to 9540E. Both stockworks decrease in width to the east and increase in width to the west and downdip. The average drill width of the Main stockwork can be estimated in 16.5 m grading 2.23 g/t Au. The Southern stockwork averages 12.7 m grading 1.49 g/t Au. Therefore, the total average drill width of the two stockworks is 29.2 m grading 1.91 g/t Au over a strike length of more than 240 m and some 150 to 250 m downdip. Figure 2. 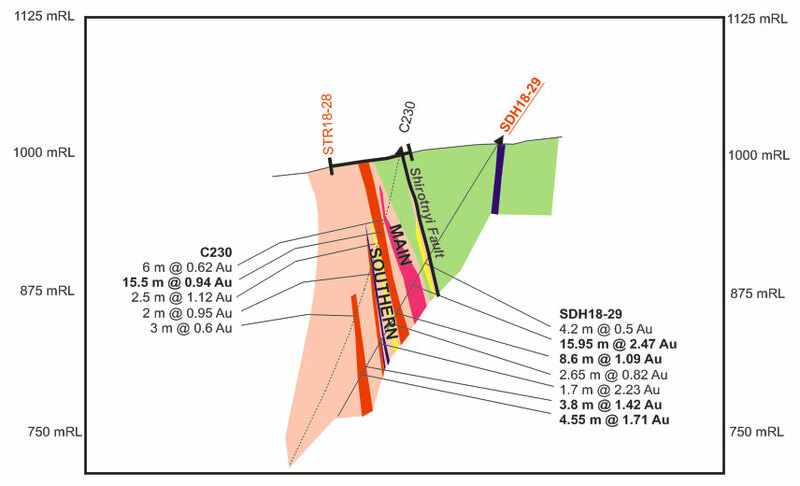 The surface expression of multiple west-east-trending gold-mineralized intervals at Zone 23, Sergeevskoe Gold Project, constrained by historical and Orsu trench data. 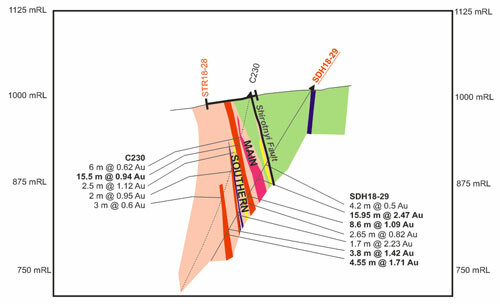 Selection of mineralized intervals in sections 9380E, 9460E and 9540E, presented below, is based on a 0.5 g/t Au cut-off for compositing, with maximum 2 m length of 0.3-0.5 g/t Au mineralization included into mineralized interval. Composited intervals in drillholes are presented uncapped. In section 9380E (Figure 3), Orsu received complete assays for one drillhole SDH18-30 (Table 1). SDH18-30 was drilled to a depth of 303.5 m southward at approximately 50 degrees underneath the previously reported Orsu holes SDH17-16 and SDH17-17. SDH18-30 intercepted multiple mineralized intervals, corresponding to quartz-tourmaline veins. The most significant intercept is 2.61 g/t Au over 19.2 m from 237.8 m, corresponding to the Southern stockwork. The mineralized interval of 0.69 g/t Au over 2.25 m corresponds to the Main stockwork, which revealed a previously reported much wider interval of 1.58 g/t Au over 19.1 m in SDH17-16. We are confident in location of both stockworks interpreted as an eastward continuation of mineralization reported in section 9300E (see press release June 19, 2018) due to their position in between the easily identifiable markers of hybrid porphyry dykes to the south and granodiorite porphyry intrusion to the north (Figure 3). Figure 3. Gold mineralization in sections 9380E (looking west). Figure 4. Gold mineralization in sections 9460E (looking west). Assay results for Orsu trench STR18-28 are pending. Historical C230 will be redrilled. For legend see Figure 2. In section 9460E (Figure 4), Orsu received complete assays for one drillhole SDH18-29 (Table 1). SDH18-29 was drilled to a depth of 283 m southward at approximately 60 degrees near and underneath the historical drillhole C230. SDH18-29 intercepted multiple mineralized intervals, corresponding to quartz-tourmaline veins in granite. 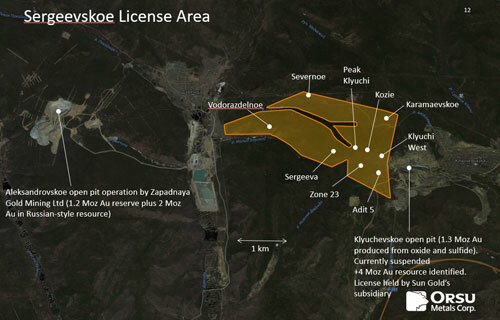 The intercept of 2.47 g/t Au over 15.95 m from 136.2 m corresponds to the Main stockwork. The mineralized interval of 1.09 g/t Au over 8.6 m from 166.9 m is interpreted to correspond to the Southern stockwork. Again, the two stockworks occur in between the easily identifiable markers of hybrid porphyry dykes to the south and granodiorite porphyry intrusion to the north (Figure 4). Downhole and to the south of the hybrid dykes, it intercepted two closely-spaced intervals of 1.42 g/t Au over 3.8 m and 1.71 g/t Au over 4.55 m, indicating a possibility of additional stockworks. Historical drillhole C230 will be redrilled during the ongoing program. 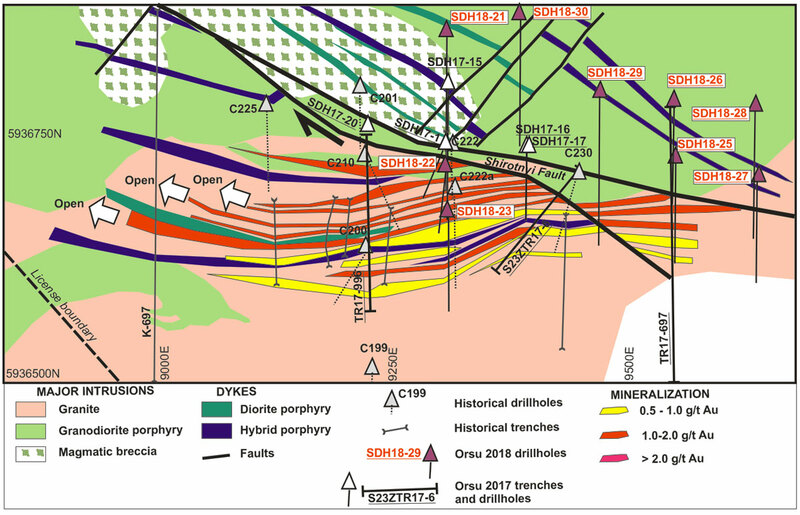 In section 9540E (Figure 5), Orsu received complete assays for two drillholes SDH18-25 and SDH18-26 (Table 1). SDH18-25 was drilled to a depth of 190 m southward at approximately 60 degrees. SDH18-26 was drilled to a depth of 276.3 m southward at approximately 60 degrees. Both holes were drilled into a previously untested area. SDH18-25 intercepted multiple narrow mineralized intervals, corresponding to quartz-tourmaline veins in granite, with most significant intercept of 0.83 g/t Au over 6.3 m from 77.85 m. SDH18-26 also intercepted multiple mineralized intervals, corresponding to quartz-tourmaline veins in granite, with two most significant closely-spaced intercepts of 1.24 g/t Au over 13.2 m from 157.75 m and 0.51 g/t Au over 12.25 m from 174.1 m. Of two markers, both holes intercepted only a hybrid dyke in the south, whereas Shirotnyi fault is present to the north and no granodiorite porphyry intrusion was intercepted to the south of the fault. This hole, therefore, intercepted only the Southern stockwork, with some additional mineralization intercepted near the hybrid dyke probably representing a continuation of the similar mineralization in drillhole SDH18-29 (see above). Figure 5. Gold mineralization in section 9540E (looking west). For legend see Figure 2. The combined true width of mineralization in Zone 23 in section 9540E is approximately 20 m, whereas it was 44 m in section 9300E. 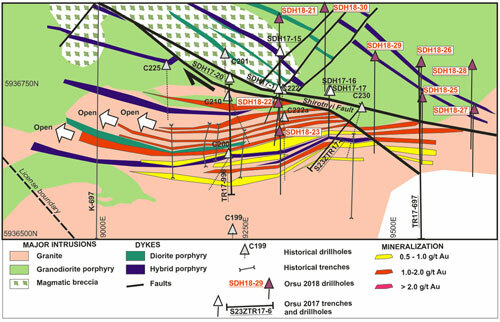 The eastern continuation of Zone 23 was tested in section 9620E by drillholes SDH18-27 and SDH18-28 (Figure 2), for which the assays are pending. Table 1. 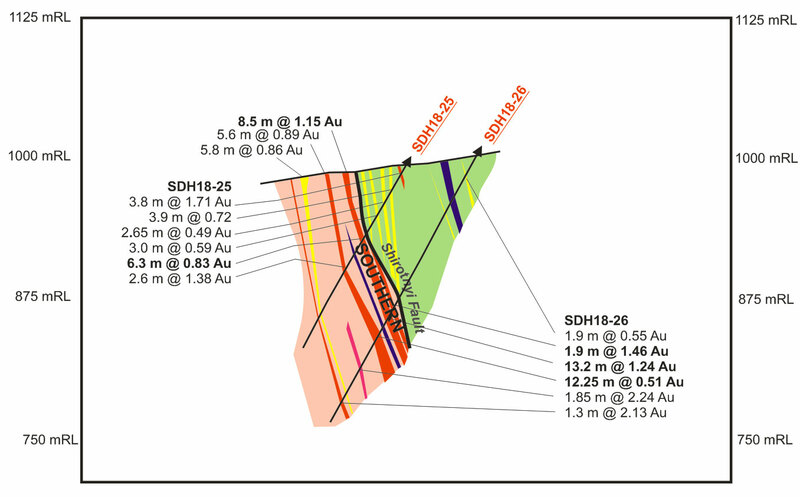 Mineralized intercepts in drillholes SDH18-25, 26, 29 and 30 at Zone 23 (above 0.5 g/t Au cut-off). The maiden resource target is 1.8 to 2.5 Moz AU in hypogene and oxide material contained in 30 to 36 Mt grading 1.5 to 2.0 g/t Au. The potential quantity and grade is conceptual in nature based on new and historical data and estimates as their has been insufficient exploration to define a mineral resource and it is uncertain if further exploration will result in the target being delineated as a mineral resource. Drillcore samples were submitted directly to the SGS Vostok laboratories in Chita, Russia, which are independent from Orsu, for sample preparation and analysis. Analysis for Au is performed using fire assay method with atomic absorption (“AA”) finish and with a gravimetric finish for samples exceeding 10 g/t Au. Results published are from the gravimetric finish if above 10 g/t Au and from the AA finish if lower than 10 g/t Au.